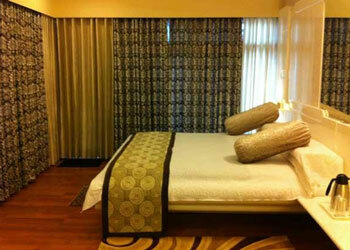 Accommodation in air conditioned Deluxe room. Morning Tea, Breakfast, Evening Tea, Lunch & Dinner (fixed menu). Pick-up & drop to Puri railway station by hotel bus. Transportation by A/C vehicle on sharing basis. Entry fee in sight seen places for India at Konark, Nandankanan Zoo, Dhauli, Khandagiri & Udaygiri cave. Packages drinking water & English newspaper in room. One day free usage of Jacuzzi for 10 mins, subject to prior appointment. One day free oil massage therapy for 30 mins, subject to prior appointment. One free Wi-fi voucher (1 hour). Fruit, Flower and cookies in the room on arrival day. Hotel HolidayResort, Puri is located right next to the beautiful Puri beach. It is conveniently reachable from the Puri Railway Station in less than 10 minutes and is about 15 minutes from the jagannath temple. Hotel has well appointed fully furnished air conditioning rooms with all major facilities including attached bath, color TV, 24 hour room service, telephon and more. Hotel facilities include restaurant, conference/banquet hall, doctor on call, travel desk, swimming pool, sauna, jacuzzi, steam bath, laundry and health club.